Since it's introduction into the market the TC Electronic Hall of Fame has become a staple of pedalboards around the world. With so many different reverb options the TC Electronic Hall of Fame 2 has a reverb for every single player out there! 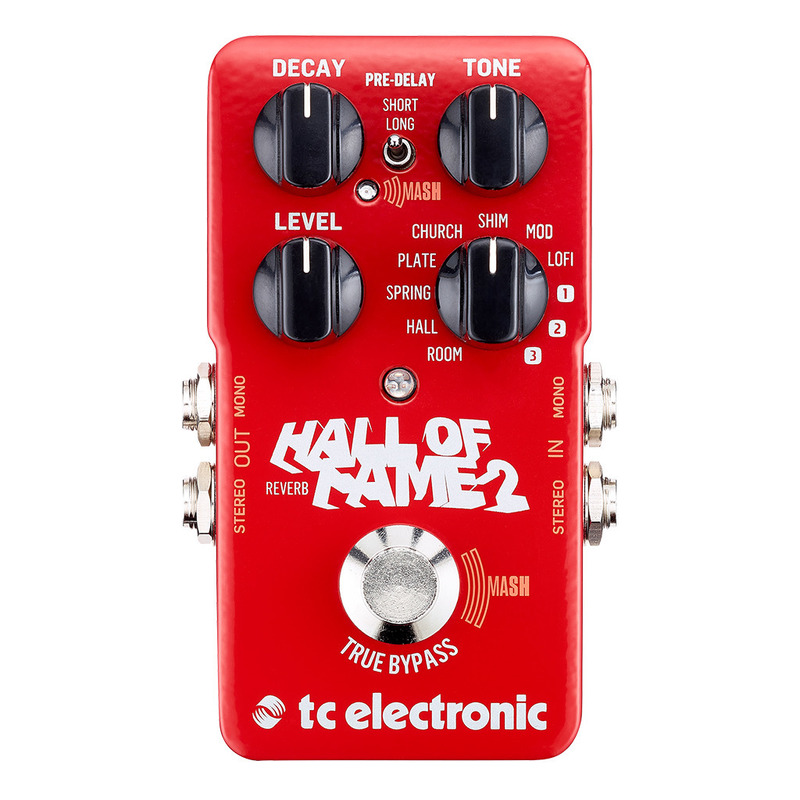 The new TC Electronic Hall of Fame 2 has a few extra features to keep everyone happy: The footswitch is now pressure sensitive to give you foot powered control over different parameters! The reverb algorithms have been updated and now include the fancy new shimmer reverb. TC Electronic is synonymous with some of the best sounding reverbs out there - think of a song with reverb on it you've heard in the last 20 years and chances are it's TC Electronic's. We're talking from Michael Jackson to Dire Straits all the way up to Lady Gaga and back and everything in between. TC Electronic's collected the iconic reverb sounds you know and love into a neat little package that simply sounds so insanely good, you gotta try it. Hall Of Fame allows you to experiment and play with reverb the way you see fit. With 10 different reverb types from plates to springs to churches and back, you'll never be without a great reverb sound the way you imagine it. TonePrint means signature effects - and signature effects means truly creative tones. From classic innovators to the guys shaping the future of music, TC Electronic's asked the coolest artists around to come up with their customised signature version of a TC Electronic effect - and make them available to you for free! Download the free TonePrint app for Android and iPhone, choose the TonePrint you want to hear and beam it instantly from your phone through your guitar's pickup into your TonePrint pedal. No cables needed! Music is the truest expression of self. That's why it is your right to have your effect sound the way YOU want to, no holds barred. With the TonePrint Editor, you get full control over all effect behaviour, knob ranges and everything in between so you can create your signature TC sound.